nessed being killed in Israel's assault on Gaza in January 2009. 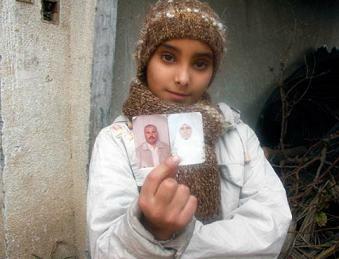 OCCUPIED GAZA STRIP (IRIN) - Mona al-Samouni, 12, is depressed and has nightmares about the day -- just more than a year ago -- when she witnessed her parents and a number of relatives being shot by Israeli soldiers in their home in Zeitoun, southeast of Gaza City. Like a number of other children who witnessed horrific events during last year's 23-day Israeli military operation in the Gaza Strip, Mona has become increasingly withdrawn and silent -- common ways of coping with tragedies, doctors say. The killing of Mona's family is one of the most notorious incidents of last year's conflict in Gaza and was one of 11 incidents investigated by the UN mission "in which Israeli forces launched direct attacks against civilians with lethal outcome" and in which "the facts indicate no justifiable military objective pursued by the attack." It said Israeli forces "killed 23 members of the extended al-Samouni family" on that day. "There is a significant deterioration in the psychological well-being of Palestinian children who are living in the Gaza Strip, especially after the recent war," Ayesh Samour, director of the Psychiatric Hospital in Gaza, told IRIN. Save the Children Sweden and the UN Children's Fund (UNICEF) on 25 January launched the Family Centers Project in Gaza. "The project will ensure that the right to survival and development of children at risk ... is ensured through the establishment of 20 Family Centers in different communities of the Gaza Strip," Patricia Hoyos, director of Save the Children in Gaza, told IRIN.